2.2 Q2) I can go up and come down without moving. What am I? 2.4 Q3) A carpet of rice, flour, sand or petals. What am I? 2.6 Q4) Scratch my head, see me turn from black to red. What am I? 2.8 Q5) To throw me, you’d prefer a crowd. What am I? 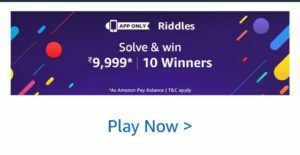 Amazon is back with a new Amazon Riddles Quiz and as usual, we added all the answers of Amazon Riddles Quiz. In this quiz, Amazon is asking 5 simple questions based on general knowledge. A total of 10 winners will get Rs 9999 as a winning amount for this riddle. 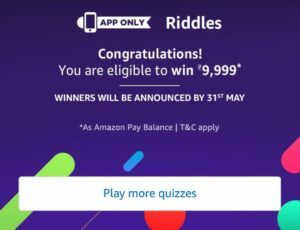 So, just check this post to get detailed information on the Amazon Riddles Quiz Answers. 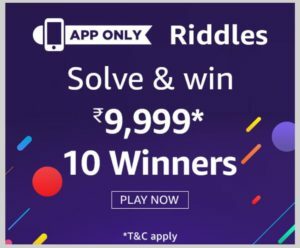 Just answer 5 simple Riddles to get a chance to win Rs 9999. 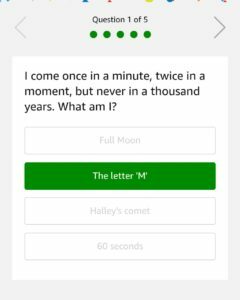 This quiz will remain live until 20th May 2018. You have to go to the bottom of the Amazon App Home page to enter this quiz. We also added Amazon Quiz Winners List, you can check that from the below mentioned link. 2. 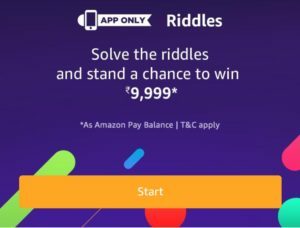 Open the app and you will see a banner about the Riddles Quiz Time contest. Click on it. 3. Now click on the ‘Start’ button to begin the Amazon Riddles quiz. 3. Now you have to click on your age range to continue. Q1) I come once in a minute, twice in a moment, but never in a thousand years. What am I? Q2) I can go up and come down without moving. What am I? Q3) A carpet of rice, flour, sand or petals. What am I? Q4) Scratch my head, see me turn from black to red. What am I? Q5) To throw me, you’d prefer a crowd. What am I? 5. After answering all 5 questions correctly. That’s it. Just wait for the Winners list of Riddles Quiz. There are a total of 10 (Ten) Prize that will be given under this Contest i.e. only 1 (one) Prize shall be given to each participant who is declared a winner in accordance with the T&Cs of the Contest. The Prize will be provided by Amazon on or before 15th May 2018 . By participating in this Contest, you expressly agree and acknowledge that Amazon and/ or any of its affiliates shall not be liable and/ or responsible, in any manner whatsoever, for any loss or damage caused to you, directly or indirectly, in connection with this Contest, including the Prize provided under this Contest. 2. In order to be eligible for the Contest, during the Contest Period, you must: (a) sign-in to your Amazon.in account on the Amazon.in mobile application; (b) choose any one (1) of the options from <18,18-24, 25-34, 35-44, 45-60, 60+ or ‘prefer not to answer’ before proceeding to answer the contest questions; and (c) answer/ solve all the 5 (Five) contest questions correctly. 3. Subject to these T&Cs, at the end of the Contest Period, amongst all participants who undertake the actions stated in Section 2 above and answer/solve all the 5 (Five) contest question correctly , 10 (ten) participants will be chosen by a random draw of lots and will each be entitled to get Amazon Pay Balance worth INR 9,999 (Rupees Nine thousand nine hundred ninety nine only) which will be credited in their Amazon account by 15th June (hereinafter referred to as “Prize”).